It’s that time of the year where we take a break from club football to enjoy a bit of the international side of ‘the beautiful game’. One of the matches of the week will see Cameroon lock horns with South Africa in a 2017 Africa Cup of Nations qualifier on Saturday afternoon. The two nations will then take their battle to Durban for the second leg which will be played three days later - Tuesday, 29 March 2016 - at Moses Mabhida Stadium. The return leg marks a very important occasion for both countries as it was 24 years ago when the two nations first clashed in a match to mark South Africa’s readmission into the international fold. The Indomitable Lions lead the group with six points, three ahead of Mauritania, whilst South Africa and Gambia have just one point each after two matches. Cameroon edged Mauritania 1-0 in their opening match on home soil, before travelling to Gambia to win by the same scoreline. It may not be pretty, but they are getting the job done. However, coach Hugo Broos may be delighted with the defensive side of his teams game, but I highly doubt he will feel the same about the attacking part of it. Cameroon did manage an impressive 3-0 aggregate win over Niger in a 2018 World Cup qualifier. The Indomitable Lions thrashed Niger 3-0 in front of their own fans, before playing to a goalless draw in the second leg in Cameroon. The surprise return to the squad is Alexandre Song. The West Ham holding midfielder retired in January, but after having a meeting with the manager, Song has now been included in the national team set-up. The 28-year old is a great passer of the ball, and has an incredible eye for those long, perfectly waited through-balls. He is strong on the ball and has that impressive work ethic off it as well. Vincent Aboubakar will lead the line with his outstanding goalscoring prowess. The Cameroonian forward is FC Porto’s highest goalscorer in the league, netting 12 times. He also scored both goals in the 1-0 victories over Mauritania and Gambia in Cameroon’s first two AFCON qualifying group games. Aboubakar is big, strong and quick off the mark with his sharp turns and explosive running. He may not posses all the skill in the world, but his clever runs off the ball to beat his man make him extremely difficult to mark. If the Indomitable Lions can claim maximum points here, they could just as well be putting the final nail in Bafana Bafana‘s coffin. Forwards: Vincent Aboubakar (FC Porto/Portugal), Christian Bekamenga (Metz/France), Eric-Maxim Choupo-Moting (Schalke 04/Germany), Benjamin Moukandjo (Lorient/France), Jacques Zoua (Gazelec Ajaccio/France), Edgar Sali (Saint-Gall/Switzerland), Anatole Abang (Red Bulls de New York/USA), Karl Toko (Sochaux/France). Ephraim ‘Shakes’ Mashaba has a mammoth task to get South Africa’s campaign back on the road after his charges managed just one point from two matches. To add salt to the wound, some of the key players are not active in their clubs, have lost form, are out injured or have just returned from injury. But Mashaba can’t make any excuses. Bafana Bafana lie at the bottom of the table in Group M, and have nobody to blame but themselves after a horrendous start to the competition. Firstly, Mashaba’s chargers were held to a disappointing goalless draw at home in their opening qualifier – dominating possession, missing chances as usual. In the second qualifier, Mauritania shocked 10-man South Africa 3-1 on home soil. Bafana Bafana last played a competitive match in November last year when they defeated Angola in back-to-back 2018 Russia FIFA World Cup qualifiers, recording a 4-1 aggregate victory. It shows they have a team capable of greatness; starting in goal with captain fantastic Itumeleng Khune. The Kaizer Chiefs number one is only returning from injury recently, but Mashaba has shown his faith in the Amakhosi shot stopper. South Africa have ample quality in midfield, with the likes of Thulani Serero and Andile Jali providing that creative spark in the middle of the park. Serero has incredible vision in finding his teammates with the most timely passes and throughballs. The Ajax Amsterdam number 10 has plenty of trickery and pace to beat his marker. Jali will keep the ball rolling with his consistent passing and hard-running. He also has an eye for goal, which is always a bonus when you have a player who loves scoring goals from a deeper position. 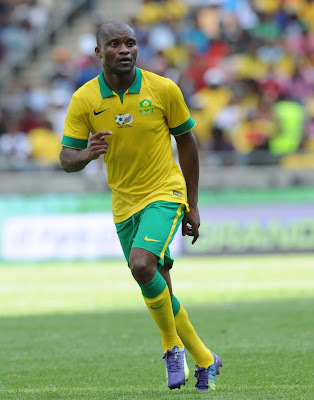 Thamsanqa Gabuza is likely to lead the line for Bafana. He is hard-working, offers great aerial ability for set-pieces and crosses, is strong on the ball as he holds it up for his teammates and has good movement off the ball as well. He and the rest of the team need to dig deep to come away with one point let alone three. Goalkeepers: Itumeleng Khune (Kaizer Chiefs), Darren Keet (KV Kortrijk/Belgium), Jackson Mabokgwane (Mpumalanga Black Aces). Defenders: Siyabonga Nhlapo (Bidvest Wits), Rivaldo Coetzee (Ajax Cape Town), Asavela Mbekile (Mamelodi Sundowns), Anele Ngcongca (Troyes/France), Thabo Matlaba (Orlando Pirates), Cheslyn Jampies (Jomo Cosmos), Erick Mathoho (Kaizer Chiefs), Sifiso Hlanti (Bidvest Wits), Thulani Hlatshwayo (Bidvest Wits). Midfielders: Andile Jali (KV Oostende/Belgium), Kamohelo Mokotjo (FC Twente/Holland), Themba Zwane (Mamelodi Sundowns), Mpho Makola (Orlando Pirates), Thulani Serero (Ajax Amsterdam/Holland), William Twala (Kaizer Chiefs), Jabulani Shongwe (Bidvest Wits), Mandla Masango (Randers FC/Denmark), Hlompho Kekana (Mamelodi Sundowns). Forwards: Thamsanqa Gabuza (Orlando Pirates), Prince Nxumalo (Ajax Cape Town), Tokelo Rantie (AFC Bournemouth/England), Dino Ndlovu (Anarthosis Famagusta/Cyprus). In seven matches, South Africa has only lost once to Cameroon with three wins and three draws – the 2-1 loss coming in their second meeting back in 1992 in Cape Town. A cagey affair is expected with Cameroon eager to take one step closer to the next round, while it’s do-or-die for South Africa. The draw looks a likely result with the teams tipped to cancel each other out.